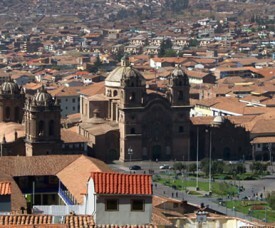 AMAUTA Spanish School in Cusco recently received a small group of 10 volunteers in Peru between the ages of 18 and 29 from Canada, the United States, and the United Kingdom. They have been travelling throughout South America and they came to do a week of volunteer work in Peru. The volunteers helped out at two of our after-school programs in Cusco that needed help with both physical labor and activities for the kids. 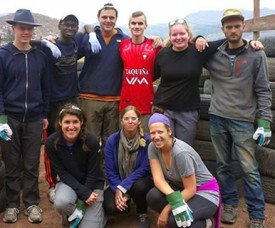 They also helped build a wall out of recycled tires and to paint a water reservoir. All volunteers had to take a bus for about thirty minutes and then walk twenty minutes or more to get to their volunteer project. Every day they worked from 8:00 a.m. to 12:00 p.m. at their designated project. For lunch the students travelled back to their Peruvian host families in Cusco then went back to one of the projects in the afternoon to work with the kids from the projects. Every year many Argentineans and tourists in Argentina come together in a small village in the mountains in Cordoba, called “Villa General Belgrano”, to celebrate the National Beer Festival. This typical German village in Central Argentina was founded in the 30s by two Germans, Jorge and Paul Kappuhn Heintze. Villa General Belgrano looks like an authentic alpine village, with houses with red gabled roofs, colorful gardens and plenty of wood. When me and my German friend planned to go to Córdoba for a weekend during my Spanish course in Buenos Aires, we found out about that the German National Beer Festival – the Oktoberfest – would be celebrated here, in Villa General Belgrano. From Buenos Aires, it takes an 8 hour bus drive to get to Villa General Belgrano. When you come from a small town like I do where there are no buildings taller than 5 stories, no buses and no subway, the thought of going to a city as big as Buenos Aires to learn Spanish in Argentina was a little intimidating. 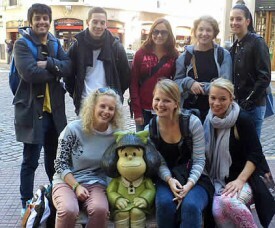 However, when I got here, everyone at the Spanish School was so nice and inviting that I immediately felt welcomed. Also, having never lived in a city before, I was a little intimidated by the thought of having to figure out how to take the subte (metro) and having to find my way around. I quickly found out that it is very easy to navigate around Buenos Aires. And if I don´t know how to get somewhere, there is always someone willing to patiently listen to me try and explain in Spanish where I am trying to go, and then give me directions. And when asking one of the staff members at AMAUTA, everyone is willing to help me get where I need to go, and have a good time doing it. 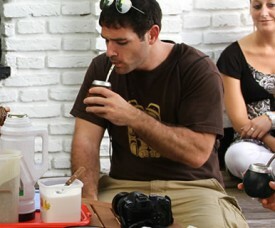 Mate is a very popular drink in Argentina and you will see people drinking mate as soon as you arrive to Buenos Aires for your Spanish classes. Even if you don’t live with a host family but elsewhere (at one of our students residences in Buenos Aires, or in a hostel), you will see local people drinking mate. Where? Everywhere! Argentine people LOVE and ADORE mate and will drink it everywhere: at work, at home, on the streets in Buenos Aires, in the parks, alone, or with friends or relatives. They call it one of the most difficult mountains to climb, because of its knife-shaped form, but hiking around this beautiful mountain in southern Argentina is really value for money. 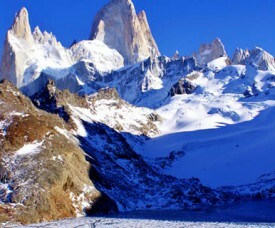 ‘Cerro Fitz Roy’ (named after the captain of “HMS The Beagle”) or also named ‘Cerro Chaltén’ is only a three-hour flight plus a three-hour bus ride away from Buenos Aires. 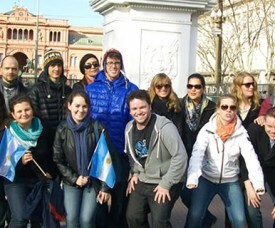 Perfect for a three/four-day excursion during or after your Spanish studies at AMAUTA Spanish Buenos Aires! This month, the Argentine Mafalda celebrates her 50th birthday. Even after so many years she still looks like a 6 year old child. No, Mafalda is not a person with some rare genetic disease, she is a cartoon character. Born and raised in Buenos Aires, Mafalda is one of the most emblematic figures of Argentine culture. The comic strip ran from 1964 to 1973 and still she is a well known character in Argentina. Up till today you will find short cartoons of her in the Clarín newspaper. Malfalda represents the Argentinian middle class and she cynically reflects on society and everyday life. The 6 year old girl is intelligent and a bit of a smartass at times. She hates eating soup but loves discussing complex matters. Even to a point that her parents don’t know how to answer her difficult questions. Often she uses her intelligence to manipulate her parents into letting her do what she wants. But always she is righteous and wants to help her friends and family.